Less than a month after one of the most celebrated presidential inaugurations in the country’s history, five Wabash students gave advice to newly elected President Barack Obama in Tuesday night’s Baldwin Oratorical Contest. The contest, now in its 135th year, featured the topic "Dear Mr. President." The event’s five finalists gave speeches with advice on topics ranging from injustice to oration. 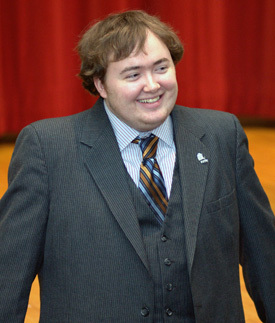 Stephen Maynard ’11 won the contest with his speech, "An Ode to Oratory. " The speech outlined a clear plan for Obama to distinguish himself from his presidential colleagues of the recent past and instead follow in the footsteps of great presidential orators such as Abraham Lincoln and John F. Kennedy. Maynard’s plan included tenets such as not relying on speechwriters as well as not dumbing down the content of his speeches. The other finalists included Victor Nava ’10 ("The Dream Belongs to All of Us"), Michael Nossett ’11 ("A Pensive Power"), Donovan Bisbee ’12 ("Good Night and Good Luck, Mr. President"), and Samuel Prellwitz ’10 ("Our Feet are Filthy"). Nossett and Prellwitz finished third and second, respectively, to round out the top three finishers. The contest was judged by political science Professor Melissa Butler, head football coach Erik Raeburn, and assistant admissions director Michael Owens ’02, a former rhetoric major. The contest has had a common theme or question since the mid 1990s, but that did little to stifle students’ individuality. Rhetoric Professor David Timmerman was impressed by the stylistic diversity of the performances. "You see a variety of delivery styles, some more attached to a manuscript, some less. You saw a variety of techniques; Sam Prellwitz had several metaphors guide his speech, whereas Steve Maynard had a series of points he was trying to make. I found their differences interesting." Bisbee, a freshman from Portland, Oregon, even made a mock prize presentation to President Obama, pointing to imaginary objects on the stage, such as a floundering economy, and congratulating the president as though he had just won them in some kind of sweepstakes. Despite all the flair, strong emotional appeals, and metaphors from some of the contestants, Maynard ultimately won the contest by focusing in on a specific and unique piece of advice. "When the topic is set, what we’re really looking for is evidence of originality and creativity in finding an answer within the confines of the question," said Professor Butler. "We thought that Steve Maynard, by focusing on how the president should address the people, was doing something a little bit different. The things he covered were not covered in the other speeches and were good advice to the President." The topic was special for Maynard, especially since he met Obama when the then-senator came and spoke at Maynard’s high school. As the visit came to a close, Maynard was able to snag a handshake as the future president was getting in his car to leave. But despite Maynard’s encounter, his real inspiration for his speech came from a more historic love. "I started thinking about social policies and economic policies for the presidents, and then I realized what change I really believed he could bring was a change in the way that a President spoke to the country. I adore reading old presidential oratory, and I thought that this President especially has the opportunity to remake it." Professor Timmerman was impressed with the way the students handled the question in a serious and thoughtful way, resulting in a very high level of orations. Maynard echoed those sentiments. "Tonight there were five spectacular orators. I was extremely happy to see four other Wabash men who have exceptional talent for speaking and who really gave a speech that meant a lot to them, and I hope that the contest in the future has the same level of competition." In photos: Top left, Maynard. Lower right, Nava, Bisbee, Prellwitz, Maynard, and Nossett.